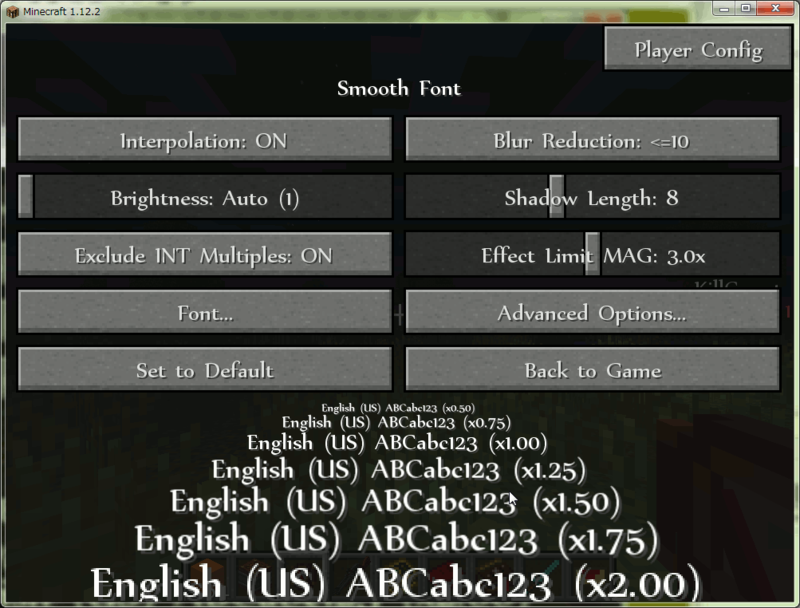 This mod draws all fonts (including resource pack's fonts) smoothly for better readability on all scales. Furthermore, you can use any font installed on your computer. 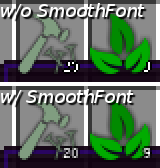 Smooth Font is the successor to my mod Unicode Font Extension. 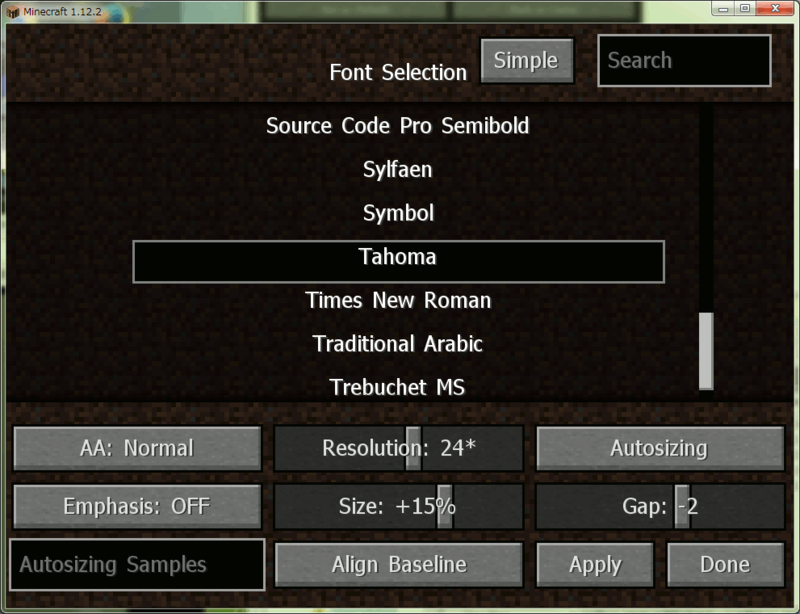 However, this mod is effective not only for unicode fonts but also for default MC fonts and many functions have been improved. Normally, characters are not displayed cleanly in the following situations. However, this mod can display characters cleanly even under these situations. These features work by just installing this mod, basically any settings are unnecessary. Furthermore, this mod has the following additional functions. Any fonts installed on your computer can be used. Enable the Large GUI scale in unicode font mode. And, this mod is created as it should be effective for most texts of many other mods. Pressing [HOME] key opens the configuration GUI by default. Since v1.15, external font files in specific folders can be used in addition to fonts which are installed in a system. 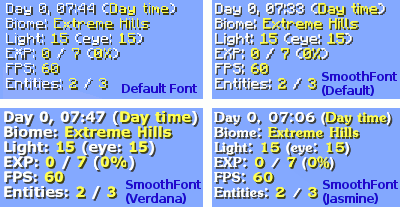 By default, font files located at <minecraft folder>/fontfiles folder can be recognized and these fonts are listed in a font selection list of a GUI. The font folder paths are configurable in a config file. Most of TrueType, OpenType and Type1 font files can be recognized. ex) If you add "font" to "externalFontsPaths" in the config file, the "font" folder can also be recognized by SmoothFont. The "fontfiles" folder doesn't exist by default and it is necessary to create "fontfiles" folder by yourself if you use the external font files feature. If you include font files in your modpacks, please pay attention to the permission and the license of the fonts. 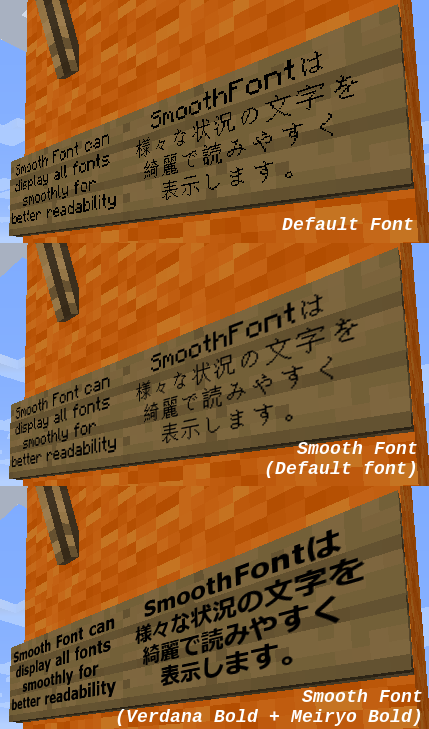 Support for default MC font including resource pack fonts. More beautiful scaling of characters. Blur reduction for interpolated low resolution fonts. Faster font image generation by multicore CPU. Use of external font file. Print font renderer classes managed by smooth font. Set a font width precision mode for the specified font renderer. It will be saved to config file simultaneously with the change. High precision: Best quality in font width. Normal precision: Moderate quality and better compatibility in string width calculation. Vanilla precision: Vanilla equivalent quality and maximum compatibility in string width calculation of unicode font. Disable or enable smooth font functions temporarily for the specified font renderer. Disabling can nearly completely bypass the smooth font functions for the target font renderer. This is temporary change and NOT saved to config file. To make changes permanent, please add the font renderer class to "unaffectedClasses" in config file manually. This is a client-side mod, so it is not necessary to install on the server. Don't use Unicode Font Extension with Smooth Font. Naturally, these mods conflict. Currently MC1.8.9 version does not work with optifine. => Solved in v1.6!! If you want to use this mod with FastCraft on MC1.7.10. 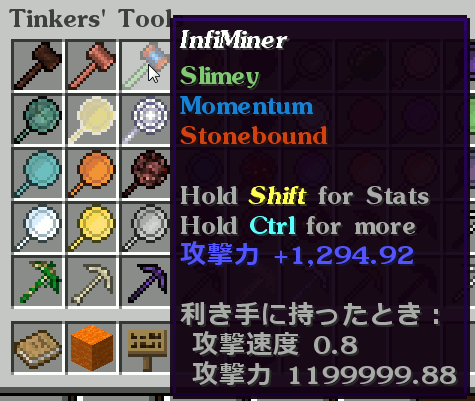 Please specify "enableFontRendererTweaks=false" in FastCraft.ini. it is strongly recommended to update to the latest version if you are changing the font. When using platform fonts, the higher the resolution, the more memory required to hold pre-rendered glyph images. Higher resolution and larger size settings require hundreds of megabytes of memory. The glyph images are converted to grayscale by default, so the memory usage has been reduced to 1/4. The glyph images are converted to grayscale and compressed by default, so the memory usage has been drastically reduced. (Total memory usage to hold glyph images is approximately 15MB in 32px+20% settings.) Of course, compared to the previous version, there is almost no impact on performance. Incidentally, if you are using MC default fonts or resource pack fonts, there is no extra memory consumption for holding glyph images because glyph images are read from files on demand and no glyph images are held on memory. Feel free to use this mod in any modpacks. Thanks to SuperExboom for simplified Chinese translation. Thanks to LastLife919 for Russian translation. Thanks to EnderDragonEP for traditional Chinese translation. That is strange. Dark scoreboard is the problem of vanilla, but this mod already includes the workaround for this dark scoreboard problem. 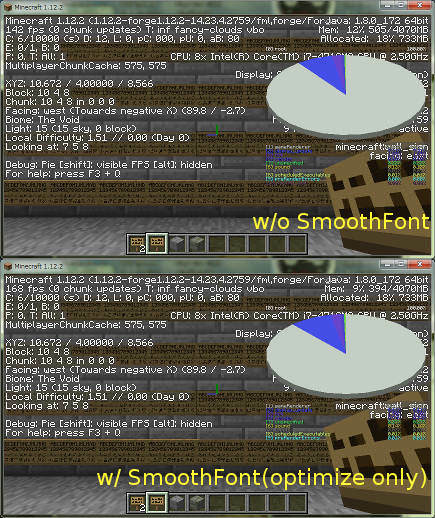 Could you check "workaroundTransparentScoreboard" in the config file "config\smoothfont\smoothfont.cfg" is set to "true"? If this option is already set to true. Please tell me the mods you use. I would like to try reproducing in my environment. OK, I added the new solution for dark scoreboard problem in v1.7. It should also work properly for SidebarMod. Please try v1.7. Hello! I am enjoying Unicode Font Extension but was wondering if there were any plans for this be on 1.7.10. Gave the beta a quick go, works OK from basic testing. Glad to have it, thank you! Thanks for beta testing immediately. Although I tested basic functions, if you find any problem, please let me know. Thank you very much! I imported it in v1.5. This mod should be the most effective in CJK font. I think it is particularly useful for people who use a Chinese character / kanji. I used the V1.5, and i found u r adding some new config. My translation was build in V1.3. So it missing some texts. And i update it. Thanks again :) It has been updated in v1.6! I've got a crash with the 1.4 release on mc 1.12.2, going back to 1.3 works though. Thanks for the report. It is a bug of new function regarding resource pack fonts. This crash has been fixed in v1.5. I have not used it for now.